We have many particular ways to support our common life in prayer. 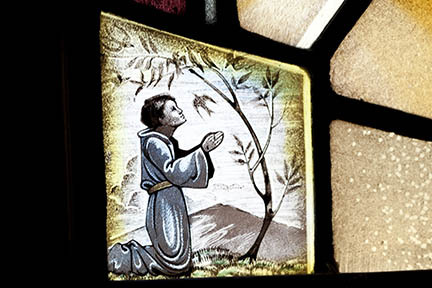 Our intercessory prayer ministry prays for those who ask for ongoing prayer in their lives; the Prayers of the People are part of the Sunday liturgy where parishioners serve as intercessors to lead us in prayer for the wider church and the world; and members gather throughout the week for centering prayer. Centering Prayer is a modern prayer practice (similar to meditation) that renews the Christian contemplative tradition and calms the noise of our hearts, minds, and lives. Simply pausing to enter a place of stillness gradually transforms and heals our relationship with God, ourselves and others. Centering Prayer is held in the Guild Hall each Tuesdays and Thursday from 5:15 p.m. to 5:45 p.m.andSundays at 7:00 p.m.. Newcomers and beginners are welcome. The Daily Office is the part of our Anglican heritage that most deeply resembles the prayer life of those who live in monastic communities. The Book of Common Prayer (1979) offers liturgies for ordinary people to set their daily clocks to a rhythm of prayer. The Offices are Morning Prayer, Noonday Prayer, Evening Prayer and Compline or (Nighttime Prayer). The Book of Common Prayer also offers an abbreviated form of Daily Devotions for use with Individuals and/or Families. The Lessons for each day are divided into a 2 year cycle and if completed, allows one to read through the Old Testament once, the New Testament twice, and the Psalms every seven weeks. The Daily Office “lectionary” (or schedule of lessons) is found in the back of the Book of Common Prayer. Many choose to follow the Daily Office using an online resource. One such website is Mission St. Clare (www.missionstclare.com) This site also has downloadable apps for Androids, iPhones, iPads and Kindles.